Royal Canin and Farmina N&D are two of the most common yet premium dog food options available in India. Most dog owners wonder which one to choose for their puppy since they keep hearing good things about both these companies. Having talked to countless pet owners, veterinarians and our own experience as dog owners for years, we are here to finally make the pick for the best spot. We will take into account numerous factors while deciding which dry food is better overall. Value for Money- When it comes to price, Royal Canin is significantly cheaper than farmina N&D. Even the low grain variant of Farmina is pricier compared to rc. For a price sensitive dog owner, we believe Royal Canin will fetch more value for every rupee spent. Food Quality- Quality comes at a price and that is true for Farmina as well. 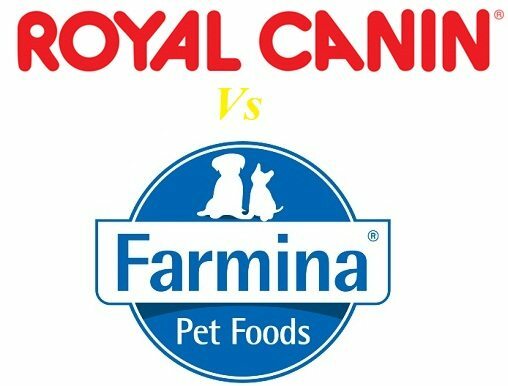 This may come as a shock to many, but Farmina is miles ahead of Royal Canin in terms of food and ingredients quality. Does that mean Royal Canin is bad quality? No, just that Farmina uses much better ingredients in their food almost justifying the premium they demand. Also, a major portion of Royal Canin diet is grains mostly rice. In contrast, there are 100% grain-free variants of Farmina where the quanity of meat and meat derivatives along with plant and vegetable protein is more. Obviously, Royal Canin has considerably more fillers than farmina. Farmina uses mostly meat. However, Royal Canin contains meat derivatives as well. Derivatives mean those organs like intentines which are not actual meat and should be preferably discarded. Farmina specifically mentions that they don’t use meat derivatives like feathers, beaks, bones etc in their premium range,but we are not so sure about Royal Canin. Overall protein percentage is also higher in Farmina as a result. Not just on paper, our experience suggests farmina can give much better results in terms of growth and energy level than Royal Canin although at a steep price. If price is not an issue, Farmina wins hands down in terms of overall food quality. For the variants with low grains, farmina uses oats,spelts (wheat) in place of rice and corn for better digestion. Packaging quality- Packaging of Royal Canin is quite inferior compared to Farmina. Worms in sealed packets can be common in Royal Canin packets at times. We don’t know if some of them happen due to a manufacturing defect or inadequate pest control and storage by their distributors, till date we never found worms or decayed food for farmina. Which such defects for Royal Canin are rare(1 in 50), still they happen at times. So, we are glad to announce that Farmina is the winner in terms of food quality and packaging keeping in mind that we considered onlygrain-free and low grain variants in our comparison(Not Farmina Cibau). For a price sensitive customer, Royal Canin is not bad either and is still the most popular option among dog owners. Both these foods are equally liked by dogs and puppies alike. Both of them are certified and approved by AAFCO. Undoubtedly, they are much better than many of the popular dog food brands like Pedigree and Drools(yes, drools focus as well). Have you used any of these dry food brands and noticed different results? Let us know in the comments below. Top Dog food brands available in India and their reviews. Sir, my labrador puppy entered into fifth month old how much i feed labrador jr. Royal canin. Sir, what is the difference between long tail and short tail in Labradors.. My dog is fox-red.color with long tail. Is it good breed? My gsd puppy age 45 days. Which is best for her grothing. Farmina if you are not on a budget. What about farmina cibau and farmina team breeder ??? My Husky is now 14 week old , if I choose Farmina what is the quantity I need to feed her everyday . Is there any other particular brand food for husky ? Sir….which one is good for 6months old beagle?? Royal canin or n&d.. Both. N&D if budget is not a concern. Hey, I have a 7 months old pit, which N and D product will be the best for him? Farmina N&D low grain chicken pomegranate maxi/medium puppy or grain free lamb blueberry maxi medium puppy will be suitable. All in All it seems that the Farmina Formula is superior for those that are absolutely looking for the most premium in dog food. The only problem found is the product packaging……bags are not resealable and require another means of maintaining an air tight environment. Farmina is better than rc. But orijen and acana are even better. Try mixing few chicken pieces or curd with the dry food in first few times. See if he eats. If he likes grains, farmina puppy starter is low grain. Sir, Can you elaborate is fermina is having any Patent in dog food ” ? As per my Knowledge Royal Canin having his own research industry with 3 Patent In dog food. And fermina is always advisable with Any Gut feed medicine that may Increases Cost. I have a GSD 5.5 months old, currently feeding him Royal Canine Maxi Junior. Which Farmina variant would you recommend I should switch to? Farmina low grain maxi puppy or grain-free lamb blueberry puppy. i guess india and pakistan have more common problems then i previously imagined. I was also facing the same dilemma, whether to go for a royal canine or farmina for my bull mastiff pupps. Thats when i googled it and found your blog. i guess i ll go with farmina due to the extra nutrition it shall provide. Any idea which one i should go for whether a grain free one or one with low grains.. i was thinking of going for the grain free since bull mastiffs are know to have gestation issues. looking forward to your feedback. Grain-free like farmina and less grains like rc both are okay. Problem is without those containing 80% fillers or grains. Tail size may vary depending on the lines and also may differ from one individual specimen to another. From what you have stated there is every reason to believe that you have a great dog and pls remember that it’s the bonding and love that matters more than anything else. Hey I am feeding n&d farmina no grain pumpkin formula to my pregnant dog is it safe as this just come as adult food or should I go for rc starter ? Pls leave your valuable advise. Starter food can help in improving lactation support. Before the puppies come, you can feed adult food. Farmina puppy starter will be a good option for rc maxi starter. Sir the quality of royal canin starter puppy is very poor what is made in South Africa now .what will the good food for mini starter puppy food that available in India.? I breeds toy Pomeranian. Farmina low grain puppy starter, acana small breed puppy. Till 3 months age you can give farmina nd low grain puppy starter regarless of dog breed. After 3 months, you can give low grain chicken pomegranate puppy or grain free lamb blueberry puppy both medium maxi. Hi sir…my golden retriever puppy is 8 weeks old…which food is the best option ??? Acana or farmina n & d or royal canin… and also plz share how to switch over other foods while its turning into an adult one…hope u reply as soon as possible…thank you sir…have a good day!!! Acana and farmina are significantly premium than royal canin. All of them are good options. It will depend on your budget. Currently you should go for starter food of any brand till 12 weeks age at least, then switch to junior/ puppy. If he likes farmina, it’s good. No need to go back to royal canin. Monitor his weight every week, growth depends a lot on genetics. Currently my dog is having n&d starter, she is 2months old. But she is having black/dark brown stool. Previously the seller used to feed royal canine. When she was on royal canine the stool was light yellow something. I shifted to n&d, the stool is dark brown/ black. Rest everything is fine.